Tecpro�s operations are based at Ahmedabad, Bangalore, Chennai, Gurgaon, Hyderabad, Kolkata, Mumbai and Pune. The design and engineering activity is undertaken from Ahmedabad, Bangalore, Chennai, Gurgaon, Hyderabad, Kolkata and Mumbai. We have four manufacturing facilities out of which three facilities are located at Bhiwadi, Rajasthan and one at Bawal, Haryana. 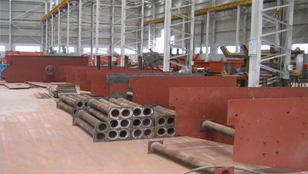 We manufacture stackers, reclaimers, crushers, screens, feeders and fabricated structures at our factory in Bawal, Haryana. Our plant at Bhiwadi, Rajasthan has facilities for manufacturing pulleys, idler& rollers, structures, feeders, screens, conveyor systems, conveyor components, crushers and screen parts. 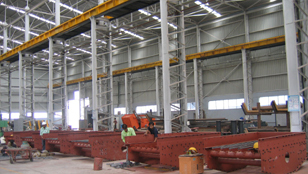 We have a casting unit in Bhiwadi, Rajasthan for both material handling and ash handling equipment. 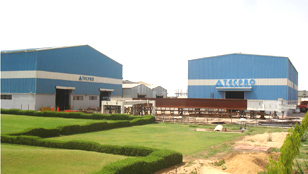 The third unit at Bhiwadi, Rajasthan manufactures ash handling euipments. Over the years, we have developed extensive in-house mechanical, electrical, civil, design and engineering capabilities with an established track record of executing turnkey projects in the power, steel and cement industries. We have an in-house design and engineering team, consisting of 287 engineers and experienced project management team which gives us control of the entire process, from conceptualization to commissioning of a given project which helps us in providing customized solutions as per our clients� specific requirements. Our design, engineering and marketing teams are spread across offices at Gurgaon, Kolkata, Mumbai, Secunderabad, Ahmedabad, Chennai, Pune and Bangalore which provides greater flexibility and efficiency. The engineering facilities are with state of the art software and tools like AutoCAD and Staad and supporting plotting facilities. Our ability to design, manufacture and commission material handling and ash handling systems in-house provides us with a competitive edge and helps reduce costs and execution time.